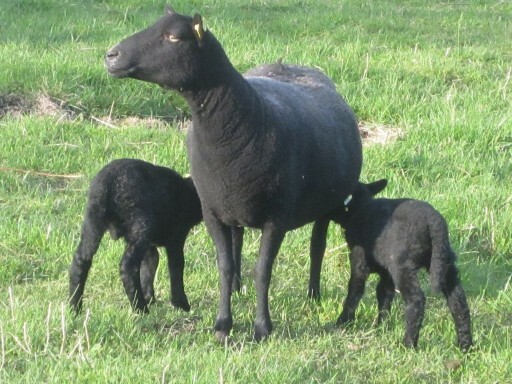 At Desert Weyr we breed high performance Black Welsh Mountain sheep for the farm flock owner who wants easy care sheep that perform well on forages alone. Our superior mutton is for the local food aficionado ready for a rich flavorful meat that is out of the ordinary. Rich, deep black wool provides a neutral background for the fiber artist whether you are a spinner, knitter, weaver or crocheter. Our small family farm produces animal products in a humane and environmentally friendly way. We provide our food and fiber animals with a healthy life and a quick humane death. We manage our pastures in a sustainable fashion designed to improve soil fertility and the farm environment. Black Welsh Mountain Sheep are an old British breed noted for both meat and wool production. They are small and easy to handle. In the UK Welsh Mountain sheep are noted for providing the best tasting mutton. We cannot ship meat but it is available at our farm store and in Paonia at Lizzy’s Market. Try some tasty Black Welsh Mutton at your next special event. The fleece is a dark black or reddish black called cuchddu. Check out our shop for raw fleeces, washed and carded roving, spun yarn and sturdy hiking socks. Sheep manure is a wonderful fertilizer and we offer it for sale to local gardeners by reservation. We also save and prepare the horns from the rams for crooks, buttons and knife handles. It is our responsibility to use as much of the animal as we can and we take our responsibility seriously. Come visit and see our wonderful sheep. Learn how we manage our small farm on a daily basis and get to know our flock!